The UK has the largest percentage entrepreneurial gender gap in the G7 economies. This article offers possible solutions to aspects of this problem by encouraging policy formation to take into account successful examples from beyond a 'First World' perspective. This alternative approach to entrepreneurial gender equality centres on a more holistic global perspective, and uses female entrepreneurship in Colombia as an example of solutions to the UK's problems. In the summer of 2011 the University of Warwick's Institute for Advanced Teaching and Learning funded my research in Colombia. I interviewed women in disparate geographical, economic and social situations, and gained an understanding of Colombia's more gender-balanced entrepreneurial climate. Interviews, internet research, and statistical analysis all illustrate that there is much the UK can learn. Analysis of the Global Entrepreneurship Monitor's data, coupled with my research in Colombia, resulted in three key recommendations for British policy. Firstly, an onus on entrepreneurial training within the education system would help provide prospective female entrepreneurs with confidence and business acumen. Secondly, stronger state-provision of childcare would remove the choice between being a 'good mother' or an 'independent businesswoman', and would support those making difficult economic choices. Finally, the nebulous aim of promoting confidence can be achieved through offering public examples of strong women in positions of economic and political power. Press coverage of Colombia largely centres on security risks, drug-trafficking and extreme poverty. However, the press perception is far bleaker than the reality. The reality is that countries often declared less 'developed' than our own still have much to teach us. Rather than ignoring or patronising countries like Colombia through negative press, we should examine the numerous positive aspects and understand aspects of our own country that can be improved. Initial interest in this project was sparked when the Global Entrepreneurship Monitor (GEM) placed Colombia 3rd out of 46 nations studied for female established business ownership rates (Kelley et al., 2011: 31-32). Furthermore, Colombia's economic situation is more developed than commonly envisaged. The World Economic Forum's 'stages of development' theory does not classify it as a 'factor-driven economy'; instead, Colombia ranks as an 'efficiency-driven economy' with strongly developing markets, health and education (Schwab, 2011: 130). Although not akin to the UK (an 'innovation-driven economy') these economic indicators highlight that comparisons can be made between some aspects of Colombia and UK economies, due to some structural similarities. Furthermore, the UK's wide gender gap for entrepreneurial activity is an area that needs to be examined, especially as the policies followed for the last decade have proven less effective than intended. The UK has the largest percentage entrepreneurial gender gap in the G7 economies, and 2010 data pointed to a worsening situation. New approaches and inspirations are needed. Examining what can possibly be learnt from 'less developed' nations can provide the direction necessary to encourage female entrepreneurship. This paper does not promote entrepreneurship as an intrinsically positive phenomenon, to the exclusion of social costs. However, it does sit firmly within the current capitalist paradigm. Despite progressive assumptions linking to state spending and infrastructure, it is not a theoretical paper; rather it focuses on empirical evidence and seeks to redress a problem being faced in the UK's current economic climate, bearing current government intentions in mind. In seeking to minimize the gender gap in British entrepreneurial activity, the paper attempts to improve the legal and economic situation of women - feminism also within current paradigms. The current economic system is not without its failings and there is much scholarship attempting to offer alternatives to rectify it. This paper does not recommend an entire overhaul, but is intended to outline policy recommendations that are both manageable and workable within the today's economic and political climate. This study examined the work of the GEM from 2006-2010, as its national teams carried out data collection annually in both Colombia and the UK. The GEM is the largest ongoing study of entrepreneurial dynamics in the world, with two main components of data collection. Firstly the Adult Population Survey (APS) questions a minimum of 2000 people, tracking individual 'entrepreneurial attitudes, activity, and aspirations' in order to assess the grass-root drive for entrepreneurial activity. The 2010 Colombian report (which is the prime GEM dataset used for Colombia in this paper) interviewed via telephone 10,200 people aged between 18 and 64, from varying socio-economic backgrounds and geographical locations, to acquire their data (Gómez et al., 2011). The British survey for 2010 included 10,403 adults aged between 16 and 80, across 13 geographical regions (Hart et al., 2011). GEM data is exceptional as it offers 'uniform definitions and data collection across countries for international comparisons' (Acs, 2006). It is consistently used as the basis for academic papers, and represents a valuable addition to scholarship (Van Stel et al., 2005; Autio, 2003; Acs, 2006; Cowling et al., 2003; Baughn et al., 2006; Aidis et al., 2008). In addition, much work has been undertaken regarding female entrepreneurship in the UK. GEM data has been used in conjunction with other sources to assess mindsets, opportunities, and limitations faced by women in the UK (Department for Trade and Industry, 2003; Harding, 2006a; Harding, 2005). These assessments offer more insight than I personally could amass and offer a targeted evaluation of the opinions and situation of British female prospective and current entrepreneurs. Travelling to Colombia in July 2011, funded by the University of Warwick's Institute for Advanced Teaching and Learning, offered me the opportunity to attempt to understand the mindset of Colombian female entrepreneurs. Despite Colombian figures included in the GEM 2010 Women's Report and in the national annual report, there are no comparable GEM studies targeted at specifically assessing the mindset of female entrepreneurs in Colombia. In response to this informational deficit, the data I collected while travelling offered a limited insight. Before leaving the UK, I wrote a questionnaire and translated it into Spanish, carrying copies with me as I moved around the country. The questions were the same for every entrepreneur, briefly addressing business size, location, age, entrepreneurial motivations, media presentation of female entrepreneurs, government restrictions, investment opportunities, female business networks, and the confidence of female entrepreneurs. When women were illiterate, I either read the questions to them, noting down their answers, or local men helped. The women interviewed, rather than seeming inconvenienced, were thankful to be asked for their opinions, often attempting to offer me gifts to show their gratitude! Data collection was limited by a short time-frame (a month in total), and the difficulties in independently sourcing and collecting data. Travelling around Colombia alone meant that I interviewed a very small number of women. I sought to emphasise a qualitative, rather than quantitative, survey, reflecting the varying economic, social and geographical positions of women. When seeing a street filled with female fruit and sweet vendors who were often illiterate, I would interview one to represent them all, to avoid gathering many similar stories. My aim was to find women from different social classes and to reflect the diversity within Colombian female entrepreneurship. Rather than amassing 50 surveys dominated by the same story, I worked to find some more economically privileged entrepreneurs, more reflective of the situation of women in the UK. The twelve surveys I have used as data are limited in number but diverse in situation, offering an insight into national perspectives that transcend class barriers. In this paper I have also identified five main reasons for Colombia's narrower entrepreneurial gender gap. These categories were deduced from a combination of GEM data and themes consistent across my limited surveys. Finally, the real names and locations of Colombian women are used throughout this paper. The women surveyed were happy to have their names printed, and often grateful to be asked their opinions on their livelihood. This paper faces some of the same difficulties as the GEM survey in creating measures that effectively compare nations at very different 'stages of development'. Acs clearly outlines these 'issues', explaining that high self-employment figures are often seen as positive symbols of development, while in reality portraying institutional weakness and a lack of employment alternatives (Acs, 2006). Balancing seemingly positive indicators with the reality of opportunities (or lack thereof) in an 'efficiency-driven economy', is a challenging task and means any data has to be analysed in a nuanced and considered way. In response to this difficulty, this paper does not recommend increasing female entrepreneurship in the UK at any cost. My research in Colombia offered consistent tales of unavailable funding and loans that would greatly have assisted business creation, illiteracy among three middle-aged women who ran small businesses, and limited state support. It is definitely not my aim to recommend the creation of any circumstances that would force British women into entrepreneurship through lack of alternatives, education, or state support. Colombia was specifically chosen as a comparable country because it is not classified as a 'factor driven economy' and the gap in educational standards compared to the UK has drastically narrowed in the past decade (see Appendix 1). Many young people in Colombia have grown up in a transformed country from the one their parents knew. Education is prized as the mark of a developed society - a tour guide in Manizales told me that Colombians often show a town's university when first offering tours to visitors, reflecting pride in their educational achievement - and a degree in Business Management is well respected. Young entrepreneurs often have strong education and increased economic opportunity, offering a positive comparison with British entrepreneurs. In addition, experiences from Colombia's burgeoning middle class present examples of economic and employment opportunities and alternatives, making young middle-class Colombian female entrepreneurs a viable comparison. As a response to the difficulty of comparing developing and developed nations, the GEM survey created categories of 'necessity-driven' and 'opportunity-driven' entrepreneurs. This dichotomy attempts to measure levels of opportunity in countries, rather than praising entrepreneurial activity as positive in all circumstances. This dichotomy attempts to measure those pushed into entrepreneurship by lack of alternatives ('necessity'), compared with those who were pulled into entrepreneurship due to a perceived gap in the market ('opportunity'). Although the intention behind the measures cannot be faulted, the bifurcated description over-simplifies the motivations of entrepreneurs creates a negative perception of informal entrepreneurship, which can lead to stifling government policies in response. The measures ignore changes in motivation over time and the mixture of motivations that stimulate entrepreneurship. Colin C. Williams's study of 'necessity-driven versus opportunity-driven entrepreneurship' in England, Ukraine and Russia illustrates the deep-rooted weaknesses of this dualism (Williams, 2008). His study found that only 10% of English entrepreneurs, 5% of Russian entrepreneurs, and 7% of Ukrainian entrepreneurs were motivated solely by opportunity. In addition, 49% of Russian and 51% of Ukrainian entrepreneurs' motives changed over time, from necessity to opportunity. When examining the distinction between necessity-driven entrepreneurs and opportunity-driven entrepreneurs, many have asserted that necessity-driven entrepreneurs have a negative effect on economic development (Acs, 2006; Harding et al., 2006b; Minniti et al., 2006). Williams's exploration disagrees, due to the static nature of categorisation, as 'necessity-driven' entrepreneurs can later prove powerful additions to a developing country's economy. The more fundamental issue is that the measure constructs a false dichotomy between 'opportunity-' and 'necessity-driven' entrepreneurs. This theoretical flaw leads to stark opposition of developed and developing countries, ignoring the multiplicity of reasons leading to entrepreneurial activity. Simplifying the intricacies of people's motivations further simplifies the differences between developed and developing nations. A more nuanced method of analysing motivations for entrepreneurial activity needs to be developed. This paper rejects the GEM's oversimplified dichotomy when considering the ratio of male to female entrepreneurship. In the UK the percentage of early-stage entrepreneurial activity by men more than doubles that of their female counterparts (Hart et al., 2011). In both the early stages of entrepreneurship and when businesses are 'established', the UK had the largest percentage gender gap in the G7 economies in 2010 (Canada has not been part of the GEM surveys since 2006). More concerning is that the gender gap for Total early-stage Entrepreneurial Activity (TEA) widened in 2010 (Hart et al., 2011), and is at its widest in the 18-24 age range, where male TEA is nearly four times that of women pointing towards a worsening situation (Harding, 2006a). Attitudinal problems of prospective British female entrepreneurs are frequently cited as the reason for such a large gender gap. Many studies have highlighted the lack of confidence British women seem to have in their own abilities as entrepreneurs and their fears of failure (Kwong, 2006; McGrath-Cohoon et al., 2010). GEM found that 'nearly 37% of women said that fear of failure would prevent them from starting a business in 2005 compared to 32% of men' (Harding, 2006a: 31). Moreover, there were substantially fewer (roughly 20%) women who believed they had 'the skills to start a business' than the male respondents (Harding, 2006a: 31, Fig. 7). For the last decade, the British government has pursued a policy of enhancing networks of female entrepreneurs and making accessing funding easier for women. It is becoming increasingly frequent that women, having used these services to start-up a business, commonly 'drop out'. Although we should not completely undo past initiatives, these statistics do illustrate a failure and the need for new methods and inspirations to encourage female entrepreneurship in the UK. Finding mechanisms that encourage 'confidence' is no mean feat, but it is one that has to be undertaken in order to improve the situation in the UK. There appear to be five main reasons for Colombia's much narrower gender gap (see Appendix 2) (Gómez et al., 2011). Firstly, despite scepticism about the GEM dichotomy of 'necessity-' and 'opportunity-driven' entrepreneurs, necessity must be acknowledged as a driving factor in encouraging Colombian women to start their own businesses. The GEM calculates 'necessity' as the motivation for 48% of female entrepreneurial ventures, and 37.8% of male ventures in Colombia (Gómez et al., 2011). One woman interviewed simply explained her motivations for starting her business with 'to feed my children' (Maria Gracia, an illiterate stall holder in Popayan, 02/08/2011). However, as a symbol of Colombia's economic development, the GEM only cites necessity as only the motivation for roughly 35% of women's businesses started between the ages of 18 and 24 - compared to roughly 50% for other age groups - so its role appears to be diminishing (Gómez et al., 2011). Secondly, my research indicated that Colombian female entrepreneurs have very high levels of confidence in their own abilities. All of the women surveyed believed they were equally as capable as men, and a quarter of women surveyed answered the question on equal abilities with the same phrase - 'claro que si!' - ('clearly, yes!'). In addition, confidence levels did not link to age; women of all ages were confident in their entrepreneurial abilities. Many academic assessments have focused on the necessity of confidence to encourage female entrepreneurship, often viewing it as the 'only well-validated trait on which western and non-western women differ from their male counterparts' (Birley,1998: 5). Thirdly, close family ties make starting a business much easier. Family are available to help with childcare, start-up costs, and working hours. Over half of the businesses I interviewed were initially set up, or at least part-funded, by families. This partially reflects difficulties in getting private funding to start businesses; the World Economic Forum rates 'access to financing' as the third most problematic aspect of doing business in Colombia (Schwab, 2011: 130). Fourthly, the women interviewed were all economically motivated to start businesses. Economic motivation does not equate to necessity. Many of the women had other economic options - the difference is psychological, as the priority is economic gain, rather than independence or an improved lifestyle. In the UK motivations are often centred on lifestyle and freedom, as opposed to financial gain, which hugely alters the mindset of the entrepreneur (Small Business Service, 2003). Only 2% of men cited family reasons as their motivation for becoming self-employed, as opposed to 21% of women. A further difference seemed to be in the concept of providing for your child - many women in the UK see time with their child as the key to caring for it (leading to entrepreneurship as a lifestyle choice), while the Colombian women interviewed (especially those who are relatively poor) view providing economically for your child as most important. This difference means that even with family at the heart of Colombian culture, economic motivations are most important as they are linked to familial welfare. Finally, the search for varying business opportunities was characteristic of Colombian entrepreneurship, often leading to a multiplicity of business ventures all undertaken by one entrepreneur. Laura Honeses' business consisted of a handbag and accessory shop, which also sold toy trucks, chewing gum and photocopying services. Diana Solarte ran an internet cafe/photocopying service/stationery shop/sold hair accessories and chocolate bars. Even on a larger scale, 'Distribuidora Ponquefino' (currently the largest wholesale distributor of candy in Cartagena) began as a bakery and candy wholesaler, before specialising once both sides became unmanageable. The attitude to business centres on following where profit can be made, however disparate it seems, while in the UK, we are more focused on categorising, specialising and developing one clearly defined sector. Which Comparisons can be made? As mentioned earlier, this article does not recommend transferring all findings to the UK. Not all entrepreneurial activity is productive. Institutional weakness, lack of alternative economic choices, and the removal of much of the UK's welfare infrastructure are not solutions at all. Instead, this article seeks to primarily focus on the experiences of Colombia's educated and young female entrepreneurs, and analyse which encouraging factors can be transferred or adapted to suit the UK's more developed infrastructure, social and political climate. What can the United Kingdom Learn? Due to overwhelming structural, political and cultural differences between the UK and Colombia, not all of the reasons for the encouragement of Colombian female entrepreneurs can, or should, be echoed in the UK. For example, attempts to increase the numbers of female entrepreneurs driven primarily by necessity would involve cutting back on welfare spending and employment opportunities, amounting to a lower standard of living for most women. The groups that the UK can learn from most easily are Colombia's rising middle classes and the youth. Uribe's election to President in 2002 drastically improved the living situation in Colombia, with increased health care and education spending, and improving access to microcredit for small-scale entrepreneurs. As Colombia's economy has strengthened, the youth have benefited; young entrepreneurs (as mentioned above) are much more likely to be motivated to start businesses by opportunity, rather than necessity, than any other age group (Vesga et al., 2008). In the UK, just over 3% of the 18-24 age group was engaged in TEA in 2010 (Hart et al., 2011), as opposed to 17% in Colombia in 2010 (Gómez et al., 2011). 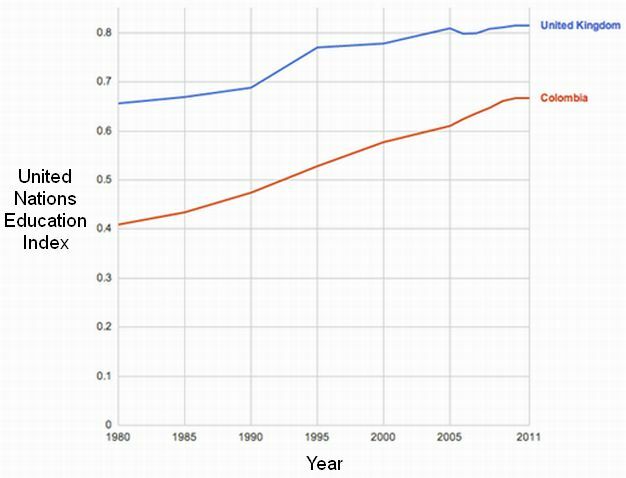 In addition, education has improved incredibly in Colombia since 1990, and the gap between the UK and Colombian standards of education has been narrowing since 2005 (see Appendix 1). This means that the youth have benefited from improved literacy rates, and furthermore tend to understand global technology and the internet better than their elders. This article recommends three key transferable ideas. Firstly, education is of pivotal importance. In both the UK and Colombia, according to the United Nations Human Development Index, women are statistically more likely to have received secondary education than men. Education in Colombia appears to follow recommendations made by the GEM to the UK in 2005 to encourage female entrepreneurship; offering more courses focused on 'enterprise training' (Harding, 2006a). Courses in Business Administration are very popular at Colombian universities; they also give students an understanding of business, and the skills and confidence necessary to run one. However, the attitude to 'Business Studies' courses in the UK is very different. Despite GEM findings that women who had accessed 'enterprise-building courses at universities or schools' were two and a half times more likely to be TEA active (Harding, 2006a: 10), the course is typically viewed as undesirable and two leading UK universities (Cambridge University and the London School of Economics) have declared the subject as 'soft' at A-level. Rather than chastising business studies, making it part of general education (similar to team-building in schools and lessons on sexual health) could be a crucial tool in increasing the self-awareness, understanding and confidence of prospective female entrepreneurs in the UK. The second issue to be focused on is childcare - family support in Colombia makes it far easier to enter into joint familial business ventures and still be able to care for your child. In Britain, the Aviva Family Finances Report published in August 2011, calculates that full-time childcare for children under two costs £546 a month, while care for those aged between 2 and 11 costs £203 a month. This is burden is heaviest for single parents 'raising two children (aged between 2 and 7)' as childcare alone consumes half their average income (Aviva Family Finances Report, 2011: 15). Despite the rhetoric of equality, British mothers often feel that they have to make the choice between providing for their child economically, or spending time caring for them (and that is only a 'choice' for those in the privileged condition of having finances available to pay for childcare). As childcare costs rose in 2011, the ONS Labour Force Survey data showed that 32,000 women gave up work to care for their children since summer 2010, with childcare costs classified as a playing a 'key' role in their decision (Osborne, 2011). Potential female entrepreneurs are even more subject to these financial fears, as fear of failure is a strong deterrent to starting businesses (Hart et al., 2011) and women financially have more to lose from coming off benefits (Fawcett Society, 2010). Removing these financial limitations from prospective female entrepreneurs would alleviate many concerns. This could be done in the UK by using state-sponsored childcare and increasing tax credits in order to echo the family support available in Colombia, and to encourage women to create enterprises without feeling that they are risking their family's welfare. Finally, confidence has been at the heart of these recommendations. Colombian women were not consistently using all-female networks to encourage confidence (a tool being employed in the UK) - instead they were seeing examples of strong independent female entrepreneurs around them. The UK needs to send a message to women that they are capable of running successful businesses, and this can be done through highlighting positive examples from female role models, as opposed to creating networks of small-scale business owners. Lord Alan Sugar and Sir Richard Branson are British household names and there is not a female entrepreneur with the same popular status. In Colombia, women have been pivotal in leading economic development, such as Marcella Echevarria, whose firm has led the preservation of Colombian artisanal techniques. In addition, women play a strong role in government in Colombia, where a law was passed stating that 30 per cent of appointed decision-making positions in the executive branch of government should be women (Htun, 2005). The UK can, and should, publicise women at the centre of politics, business and society if we really want to reap the benefits of female entrepreneurship. The differences between the UK and Colombia are numerous and vast. However, this does not mean that the strengths of Colombian female entrepreneurs cannot act as inspiration for British women and governmental policy. Policy-makers need to look beyond over-dramatic negative press reporting to view the reality of countries declared as 'developing'. Cutting off examples from the 143 countries below the UK in the Human Development Index removes strong examples to aid our development, and puts patronising other nations above unlocking our potential. Female entrepreneurship in Colombia is just one of many lessons that developing nations can teach the UK. Colombian women illustrate that with the right education, support, and confidence, women are entirely and equally capable of running successful businesses. Implementing more supportive policies, with the aim of increasing the number and confidence of female entrepreneurs in the UK, can make a vast difference. With the right infrastructural adjustments and female symbols, in the future more British female entrepreneurs could answer the question 'As a woman, are you equally capable of starting and running a business as a man? ', with 'Of course I am', like their Colombian counterparts. Further research could be undertaken on a vaster scale to see whether my data is consistent with the experiences of more Colombian female entrepreneurs. In addition, it would be interesting to assess the motivations for becoming entrepreneurs in both Colombian and the UK in more depth. Peru and Ecuador are other nations with high percentages of female entrepreneurship, and it would be valuable to discover whether their small gender gap is due to similar phenomena to Colombia. Finally, there is much more research to be done on the lessons that 'developed nations' can learn from 'developing' ones. Many institutions, especially economic, promote a linear model of development that seeks to shape 'developing nations' into a free market ideal, ignoring their intricacies. This paper illustrates that pressure must be put on these institutions to view 'development' as a wider concept and a two-way street. The following graph illustrates the narrowing gap between British and Colombian educational standards since 2000. This offers some grounding for comparisons made between young people in the UK and Colombia. Jennifer Quigley-Jones is in her final year, reading History and Politics at University of Warwick. She spent her second year at the University of California, Los Angeles and interning for the Center for American Progress, National Security division in Washington, DC. She hopes to continue in academia, specialising in Middle Eastern Politics. 'Factor-driven economies' are classified as in an economic phase dominated by subsistence farming and extraction of resources. This means that female participation in the economy is often necessitated by early stages of economic development. The differences between the economic structures, industry, political and economic situations of 'factor-driven economies' and the United Kingdom are so disparate, that it would be very difficult to translate aspects the UK could echo in order to encourage female entrepreneurship in the same way. Rebecca Harding, founder of Delta Economics, quoted in an article from The Telegraph by Richard Tyler, 'Growth in number of female entrepreneurs at a standstill', 6 June 2011. To cite this paper please use the following details: Quigley-Jones, J. (2012), 'Encouraging Female Entrepreneurship: Lessons From Colombian Women', Reinvention: an International Journal of Undergraduate Research, Volume 5, Issue 2, www.warwick.ac.uk/reinventionjournal/issues/volume5issue2/quigley-jones Date accessed [insert date]. If you cite this article or use it in any teaching or other related activities please let us know by e-mailing us at Reinventionjournal at warwick dot ac dot uk.